If you're looking for a somewhat milder My Father cigar, the My Father Connecticut line is sure to please your palate. 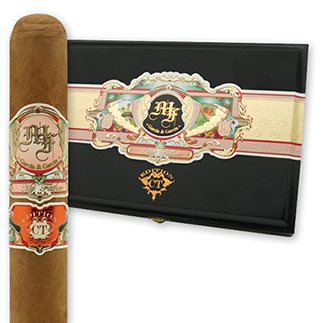 Jose 'Pepin' Garcia and son Jaime created this full-flavored, mild to medium-bodied cigar with Habano and Criollo long fillers bound in Corojo '99 leaf - all grown on the Garcia family farms in Nicaragua, including one that goes through a special fermentation process to enhance the cigar's flavor and aroma. Covered in a golden Ecuadoran Connecticut Shade wrapper that imparts a rich, creamy nuttiness, you'll discover notes of cedar, toast, earthiness, and spice with hints of coffee, chocolate, and mint on the finish. Complex, balanced, and expertly hand rolled at My Father Cigars S.A. in Esteli, Nicaragua, My Father Connecticut has unequivocally earned its place in My Father's stellar portfolio of highly rated cigars.